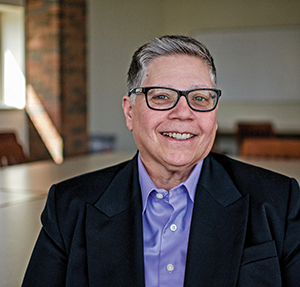 For the past 15 years, Patrice Salmeri has led the pioneering StepUP® Program at Augsburg College, setting a standard for other institutions nationwide. Now, a new position is allowing her to take her promotion of collegiate recovery to the next level. That’s how Salmeri is: She loves her students in recovery, admires them and always puts them first. 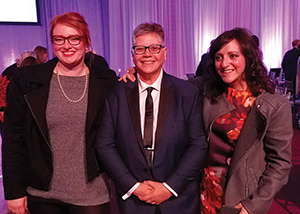 Having regular encounters with students is the biggest thing Salmeri will miss when she begins her next chapter as executive director for Recovery Advancement at Augsburg College in Minneapolis this summer. 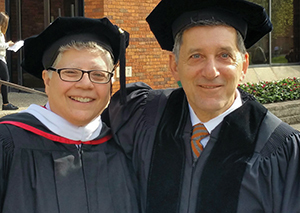 The donor-endowed position is new to Augsburg and will allow the school to expand its work in the field of collegiate recovery both on campus and around the nation. Founded in 1997, StepUP is the largest residential collegiate recovery program in the nation and has long been regarded as a national model in collegiate recovery. Calling Salmeri’s appointment “a pivotal moment for students in recovery across the nation,” Augsburg President Paul C. Pribbenow says the position will allow the college to further its mission in encouraging and shaping how other colleges and universities support young people in recovery, to work to effect policies and programs that will staunch the opioid epidemic, and to reduce the stigma associated with addiction so that young people can lead lives of meaning. Since Salmeri began her tenure as StepUP director in 2002, the program has experienced a 300 percent increase in the number of young people in recovery pursuing a college education. A past president of the Association of Recovery in Higher Education, she is nationally recognized as a champion of recovery, an expert on residential collegiate recovery and a sought-out speaker on substance use disorder issues related to young people. She has implemented and supervised numerous grant-funded expansions of the program. Notably, one project resulted in the successful implementation of collegiate recovery programs in public and private colleges throughout the United States. In her new role, Salmeri will concentrate on the reducing stigma associated with substance use disorder recovery by advising on and shaping policy issues among state and federal government agencies and offices, nonprofits and community organizations, and professional associations. 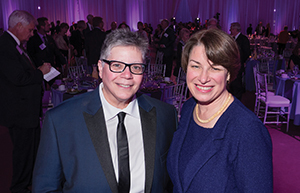 She will advise the college president on issues and resources related to support for student recovery and inspire other colleges and universities nationwide to provide recovery programs modeled after StepUP. On campus, she will develop pilot programs for students who have graduated from or left the StepUP Program but still have coursework to complete, work with StepUP alumni to understand the long-term positive effects of living in a recovery community during college, and connect soon-to-graduate students with program alumni. Salmeri shares with Recovery Campus her reflections on her 15 years of work with StepUP and how her new position will allow Augsburg to further its mission of providing a recovery-friendly campus environment for all students and educating schools across the nation on the important role these communities play in higher education. Recovery Campus: How did this new position come about? Patrice Salmeri: Augsburg received funding for a new position in the field of collegiate recovery with more strategic responsibilities that would keep the president apprised of what is going on around the country and allow recovery to remain at the forefront of the college’s mission. It’s wonderful that the college administration thinks so highly of recovery that it created an executive director for Recovery Advancement position. It speaks volumes to the college’s values and mission. RC: The change, however, must be bittersweet. PS: Since the day I interviewed for my current position, I’ve always said that this is my dream job. So, yes, this change will be bittersweet because I have been working with students for so long and will miss that daily interaction. However, I am looking forward to focusing more attention on alumni and the value they bring to our community as well as advocating on local, regional and national levels. These are all endeavors that I’ve tried to do in my current role but did not always have the time to pursue. I’m excited for StepUP to get a new director who will bring fresh eyes to the program while I focus on new populations, such as graduate and nontraditional students. RC: The StepUP Program has long served as a model for other colleges and universities. How will your new position take this service to the next level? PS: I now have more leeway to travel and help schools advocate with their administrations and begin programs. Not all schools can replicate StepUP, though, because our cornerstone is the residential component. I believe that is very important, but not all schools can provide a residence. Our program works well with high school students who are launching into college as well as older students who have not been successful elsewhere. We give them a residence hall experience without drugs or alcohol and include building a community with like-minded people. It’s certainly worked for us: We’ve gone from 23 student members annually to more than 100. The residential component started from the very beginning, and now we have an entire StepUP residence hall, which can house 106 students. Considering our undergraduate population is about 2,000, this is substantial. RC: Discuss the importance of support from the administration in the success of a collegiate recovery program. PS: When our president, Paul Pribbenow, came to Augsburg more than a decade ago, he had already done his research. He met with people in the community who understood StepUP’s importance and learned about recovery efforts and how drugs and alcohol can ravage communities and affect families. He comes to speak to StepUP students during orientation because he says they already live part of the college’s mission with what they do at meetings and how they serve the community. He calls them “storytellers” and says they are what civic engagement looks like. This is important to Augsburg. The college has won the President’s Higher Education Community Service Honor Roll several times, with StepUP contributing hundreds of hours of service toward our total. A couple of StepUP members also have won an award at graduation that goes to a student who is very involved in service to the community. It’s the highest recognition you can get at commencement. That is something they do naturally as part of their program. For example, our students have made blankets for the homeless. Their hearts go out to people who live on the street because so many of them know what that is like. 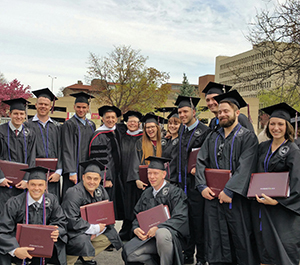 With these deeds, they fulfill Augsburg’s mission of being thoughtful stewards, contributing to the community through their time, energy and thoughts. It’s wonderful that the president and his cabinet get excited about what we do and are interested in learning from these students and their families. RC: How do you describe StepUP students? PS: These students are great examples of the best parts of recovery. This is true of students in recovery across the country: If you look at these young people, you would never think in a million years that they were drug addicts or alcoholics. We see them at their best in recovery. RC: Why are students in recovery an asset to higher education? PS: Institutions of higher learning should have a strong interest in attracting and retaining these students. When we look at surveys of recovery programs nationwide, the GPAs of students are often higher than the school’s average. Here, we have averaged a 3.2 overall GPA with students in StepUP over our 20-year history. Our abstinence rates are 97 percent, which is consistent across the country with collegiate recovery programs. The schools would also be creating a crucial environment that promotes sustained recovery. We know that the longer students stay in an environment that supports recovery, the better chance they have of staying sober for life. RC: What is the biggest challenge you see at other schools in starting collegiate recovery programs? PS: Stigma. We still hear, “We don’t want ‘those people’ on campus.” Schools often erroneously equate students in recovery to those using drugs. Wherever I go, one of my biggest jobs is to reduce stigma and to talk about it. When I teach classes, I ask, “When you hear the words ‘alcoholic’ or ‘addict,’ what comes to mind?” People don’t plan on becoming an addict, and those in recovery have beautiful stories to tell. More people need to hear those stories. This is why I bring students with me to conferences and on college visits. I like in-person stories from real people. These real-life recovery stories need to reflect the local community. It’s impressive when you bring leaders such as people in student government to talk about their recovery experiences. RC: How important are allies to students in recovery? PS: These students are important in building our community. Many students do not want to use substances due to their faith or lifestyle choice. Our events are about supporting all students who choose sobriety. We have fun — why wouldn’t other students want to be a part of that? When I first started, I wanted every student to have a circle of support. I found faculty members who were very supportive and understood addiction recovery. I also found coaches who valued helping a person getting back on track. Celebrations after athletic events can often include drugs and alcohol. It’s very difficult for a student in recovery to find a way to celebrate because it is too hard to be present and not drink. So, unless those students find allies and peers who are going to attend the game and do something together afterward, they’re alone. This year, we have five football players in the program; there’s the group students can celebrate with after the game. In fact, we have had athletes from every sport. A thriving community with students from all walks of life makes the program accessible and positive. Salmeri poses at Ausburg’s Gratitude Gala. RC: Tell us more about the breadth of the community? PS: A big worry with high school students who have a sober life is that they won’t have a “true” college experience if they don’t partake in what is going on. However, here, they have hundreds of people to support them. It’s not just the people in StepUP; anywhere you go on campus, you find people who understand. There are a lot of non-students who are in recovery, such as professors and staff. And for those people not in recovery, there are less than six degrees of separation in knowing someone who is. We’ve created as close to a stigma-free campus as I’ve ever seen. We make introductions. As soon as students get accepted into StepUP, they are paired with an upper-class student mentor. We also did a pilot program where we paired a student with a faculty or staff mentor in recovery. We found they went on to develop great relationships as they understood what those students were going through beyond the everyday stresses of college. Students don’t have to stay in StepUP all four years. If they reach a point where they feel they have the skills to live off campus, they may decide to live with others from the program. I think about 10 percent of the student population is still in recovery at Augsburg. There is a lot of support here. That’s what’s so exciting about this new position. We are already bringing alumni on campus to meet current students. Soon, we will have a network of alumni from all over the country that students can connect with who share their major. What’s great is that many of our graduates go on to pay it forward and work for or launch programs at other universities. Our community is growing nationwide. RC: How do you widen your circle beyond campus? PS: In the Twin Cities area, there is no shortage of things to do in recovery — from meetings specifically for young people to gratitude nights and dances. Our campus is in the city, which is filled with theater, art and music. We also sponsor activities with the Minnesota Recovery Connection. For example, each fall, we promote an event attended by speakers and guests from outside the campus community. It’s very powerful and is a great way to celebrate recovery. RC: How can policymakers assist in raising the awareness of the need for recovery programs in higher education? PS: We need to start by educating our officials. We encourage students to be civically engaged. Having students in recovery work in their offices and on their campaigns is an excellent strategy. Having peers speak to local governments who can legislate change is important. It’s encouraging that many states now have mandated that state-funded schools must have a collegiate recovery program. RC: You started out as a counselor treating young adults and then moved to working in recovery. What perspective has that given you on the continuum of care? PS: You can’t just drop people off after treatment. Once treatment ends, it’s the beginning of something beautiful. An investment should be given in the life of someone who has the opportunity to launch into his or her true self. We need to look at where people will be — not just where they are right now. This is why I enjoy my job so much: I see the lawyer down the way, the doctor in the making, the compassion people have in serving one another. The continuum of care can’t stop at treatment. It needs to give people a leg up no matter where they are going, whether it is college, trade school or to a job. No two journeys are the same. I like to tell people I’m a wounded healer. I have my journey and have a lot of compassion and heart for people who are going through similar things.